This article is a short summary of Fire Emblem Warriors. North American Nintendo Switch box art. North American New Nintendo 3DS box art. Fire Emblem Warriors is a crossover game in the Fire Emblem series based on Koei Tecmo's Dynasty Warriors series. The game was developed by Omega Force and Team Ninja, who had previously worked on Hyrule Warriors and Hyrule Warriors Legends. Announced during the Nintendo Switch Presentation 2017, the game was released for both Nintendo Switch and New Nintendo 3DS systems in Japan in September 2017, and was released worldwide in October. In Japan, both versions of the game were released with two special edition sets. The "Premium Box Edition" set includes a three-disc game soundtrack, a character card set, and a game art book. The "Treasure Box Edition" includes all of the contents of the Premium Box, plus an electronic dragonstone statue that includes voice clips. In Europe, the Nintendo Switch version will launch with a limited edition that includes the soundtrack and character cards; this bundle will also release in Australia as an EB Games exclusive. The North American Special Edition includes the CD soundtrack and character art cards, as well as a dual-sided poster. Battle as fan-favorite Fire Emblem heroes, like Chrom, Corrin, Ryoma, Marth, Xander and more, each with unique moves, special attacks, weapon types, and voiced dialogue. Battle as Chrom, Lissa, Marth, Corrin, Xander and more! Clash with legions of enemies as Marth, Xander, Corrin, Chrom, and other warriors from Fire Emblem by unleashing over-the-top-powerful Dynasty Warriors-style moves. Take control of characters with distinct attacks, issue strategic commands, pair up warriors for stunning moves, and more in an epic tactical action game from the Hyrule Warriors team. In the Kingdom of Aytolis, portals suddenly appear in the sky, causing monsters to appear that attack the castle. As twin royals Rowan and Lianna are escaping with the queen Yelena, the secret passage starts to cave in, and falling rocks separate them from their mother. The queen gives them the Shield of Flames as they escape without her. Lianna and Rowan must now restore the Shield of Flames in order to stop the Chaos Dragon from reawakening and save Aytolis. Fire Emblem Warriors largely draws its structure and gameplay from the Dynasty Warriors franchise, in which players chain together weak and heavy attacks to fight armies of soldiers. The game incorporates features prevalent in the Fire Emblem series, such as the weapon triangle, unit classes, the support system, and other strategic elements, as well as the ability to switch between characters mid-battle and being able to direct them to other areas on the map. Fire Emblem Warriors was originally unveiled during the Nintendo Switch Presentation 2017. During the Fire Emblem Direct on February 18, an extended trailer was showcased featuring a first look at gameplay. Development on the game had already begun by late 2015. The idea of a Fire Emblem-style Dynasty Warriors game originated at Koei Tecmo, and when the idea was proposed to Nintendo they began to discuss developing the game for their "new console", later revealed as the Nintendo Switch. 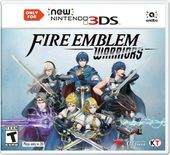 From the beginning the intention of the developers was "to make a Warriors game that can be enjoyed by Fire Emblem fans". Similar to Hyrule Warriors, when selecting what games would be represented the developers chose to primarily focus on three titles: Fire Emblem: Shadow Dragon and the Blade of Light, Fire Emblem Awakening, and Fire Emblem Fates. Producer Yosuka Hayashi confirmed that the Japanese version of the game had "gone gold" during a livestream on September 1, stating that most of development had been completed. Both versions of Fire Emblem Warriors were given a total 36/40 score (9/9/9/9) in Famitsu. 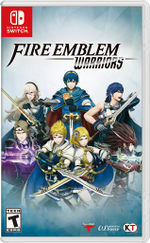 During its first week in Japan, the Nintendo Switch version of Fire Emblem Warriors was the third best-selling game at 41,491 copies while the New Nintendo 3DS version was sixth with 18,357 copies, with a combined total of 59,848 units. Koei Tecmo announced in its fiscal year financial results briefing in April 2018 that Fire Emblem Warriors had shipped over one million units worldwide. WW: October 20, 2017 Adds a downloadable content menu, adds sorting options to the weapon list, adds KO and damage counters to the pause screen in History Mode, bug fixes. 1.2.0 November 16, 2017 Adds compatibility with the English voice pack, adds a new History Mode map featuring Rowan and Lianna, adds new costumes for Rowan and Lianna, adds the Armor Strike weapon attribute and the Broken Armor status, adds new Blessings, adds the ability to sell multiple weapons at once, bug fixes. 1.2.1 November 29, 2017 Fixes issues introduced with the version 1.2.0 update. 1.3.0 December 21, 2017 Adds compatibility with the Fire Emblem Fates DLC Pack content, adds new "Hero" weapons, increases the maximum level to 110, adds additional weapon attributes, adds additional blessings, allows players to order fort commanders to restore HP, decreases the amount of KOs required to receive an S rank in History Mode missions, bug fixes. 1.4.0 February 14, 2018 Adds compatibility with the Fire Emblem: Shadow Dragon DLC Pack content, increases the maximum level to 130, adds additional weapon attributes, adds additional blessings, adds additional crests, adds the Crest Confirmation setting, UI improvements, bug fixes. 1.5.0 March 29, 2018 Adds compatibility with the Fire Emblem Awakening DLC Pack content, adds the ability to capture video, increases the maximum level to 150, allows players to rest to level 1 to obtain additional materials, adds additional weapon attributes, adds additional blessings, adds the ability to reuse the same blessing from the previous battle, adds additional crests, UI improvements, bug fixes. A Japanese voice pack was released as a free download alongside both versions of the game's international release at launch. In Japan, an English voice pack will be released for free alongside the version 1.2.0 update on November 16. Fire Emblem Warriors will feature three packs of add-on content, available for both the Nintendo Switch and New Nintendo 3DS versions of the game separately. These packs can be purchased individually, or as a season pass made available for purchase on launch day. Each pack is based on a particular game, and will each include three new playable characters, three History Mode scenarios, new weapons and costumes, and additional support conversations. By purchasing the season pass, players can unlock a bonus Bride costume for Lucina. ↑ Fire Emblem Warriors for Nintendo Switch. e3.nintendo.com. Retrieved June 13, 2017. ↑ 2.0 2.1 Fire Emblem Direct 2.18.2017. Nintendo (YouTube; January 18, 2017). Retrieved January 18, 2017. ↑ 3.0 3.1 3.2 Nintendo of America on Twitter (August 28, 2017). Retrieved August 28, 2017. ↑ 4.0 4.1 4.2 gamescom 2017 kicks off with new announcements for Splatoon 2, ARMS and more! Nintendo of Europe (August 22, 2017). Retrieved August 22, 2017. ↑ 5.0 5.1 EB Games Australia on Twitter (August 22, 2017). Retrieved August 23, 2017. ↑ Fire Emblem Warriors launches September 28 in Japan, E3 2017 trailer. Gematsu (June 13, 2017). REtrieved July 2, 2017. ↑ Here’s What Japan Gets In Fire Emblem Warriors’ Premium And Treasure Box Editions. Siliconera (June 28, 2017). Retrieved August 20, 2017. ↑ 8.0 8.1 Fire Emblem Warriors - 'Extended Gameplay' Nintendo Switch Presentation 2017 Trailer. Nintendo (YouTube; January 18, 2017). Retrieved January 18, 2017. ↑ 9.0 9.1 Marth, Chrom and new characters in Fire Emblem Warriors. Japanese Nintendo (May 31, 2017). Retrieved May 31, 2017. ↑ 10.0 10.1 Fire Emblem Warriors devs on Female Robin / Cordelia, Pegasus Knights gameplay, including Fire Emblem elements, more. Nintendo Everything (September 9, 2017). Retrieved September 9, 2017. ↑ 11.0 11.1 11.2 Fire Emblem Warriors Famitsu Interview Translation. Kite Stenbuck on Patreon (June 1, 2017). Retrieved June 4, 2017. ↑ Fire Emblem Warriors devs on how the game came to be, choosing characters / games, original characters, more. Nintendo Everything (July 15, 2017). Retrieved October 19, 2017. ↑ Fire Emblem Warriors: Elise revealed as playable character, game has gone gold. Perfectly Nintendo (September 1, 2017). Retrieved September 1, 2017. ↑ 14.0 14.1 Famitsu Review Scores: Issue 1503. Gematsu (September 19, 2017). Retrieved October 4, 2017. ↑ Media Create Sales: 9/25/17 – 10/1/17. Gematsu (October 4, 2017). Retrieved October 4, 2017. ↑ 平成30年３月期 決算短信〔日本基準〕（連結. Koei Tecmo (April 26, 2018). Retrieved April 26, 2018. ↑ 17.0 17.1 Fire Emblem Warriors Switch file size. Nintendo Everything (September 20, 2017). Retrieved September 21, 2017. ↑ Fire Emblem Warriors - Demonstration - Nintendo E3 2017. Nintendo (YouTube; June 15, 2017). Retrieved August 6, 2017. ↑ Fire Emblem Warriors: Software updates. Perfectly Nintendo (September 28, 2017). Retrieved September 28, 2017. ↑ Fire Emblem Warriors software update coming soon. Nintendo (November 8, 2017). Retrieved November 8, 2017. ↑ 21.0 21.1 Fire Emblem Warriors version 1.2 update launches November 16. Gematsu (November 8, 2017). Retrieved November 8, 2017. ↑ Fire Emblem Warriors - version 1.2.1 fixes problems New Nintendo 3DS version. GoNintendo (November 29, 2017). Retrieved November 29, 2017. ↑ 23.0 23.1 Fire Emblem Warriors’ Version 1.5.0 Update Adds A Video Capture On Nintendo Switch, And More. Siliconera (March 22, 2018). Retrieved March 23, 2018. ↑ 24.0 24.1 Fire Emblem Warriors Launch Trailer - Nintendo Switch. Nintendo (YouTube; October 17, 2017). Retrieved October 17, 2017. ↑ Fire Emblem Warriors To Get Fates, Shadow Dragon, And Awakening, DLC Expansions With New Heroes. Siliconera (September 24, 2017). Retrieved September 24, 2017. ↑ 26.0 26.1 NoA PR - Nintendo Details DLC Coming to Fire Emblem Warriors for Nintendo Switch. GoNintendo (September 25, 2017). Retrieved September 25, 2017. ↑ Fire Emblem Warriors' Fates DLC pack will be out on December 21. RPG Site (December 5, 2017). Retrieved December 5, 2017. ↑ Fire Emblem Warriors – Shadow Dragon DLC Pack. Nintendo Treehouse Log (February 13, 2018). Retrieved February 14, 2018.